It was a given after Wednesday’s number one heard ‘round the world that there was little the Mets could or would do with their on-field product to distract from the dire state of affairs. While they hold second place in the NL East, they trail the Nationals by almost ten games, deGrom now seems as lost as his contemporaries in the starting rotation, the bullpen is a dumpster fire, and costume-wearing interns feel emboldened to embody in physical gesture the clear disdain towards Mets fans as the Wilpons have had for decades. All that said, Zack Wheeler wasn’t terrible; he lasted 6.1 innings, surrendering only two runs — which, these days, on this staff, is the stuff legendary performances are made of — but those two runs held up, as Milwaukee starter Chase Anderson followed his flirtation with a no-hit bid in his last start against the Diamondbacks with seven brilliant innings, holding Michael Conforto, Jose Reyes, Jay Bruce, and Neil Walker hitless, and striking out seven overall. 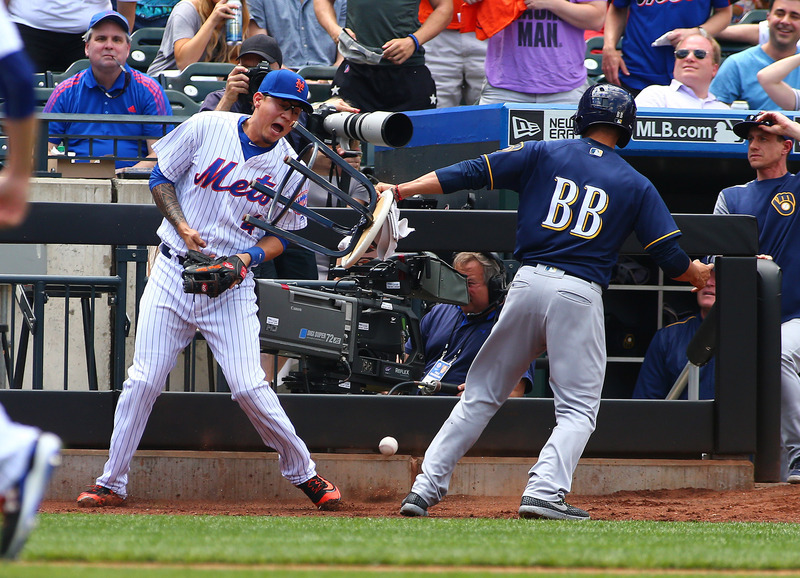 The Mets made it interesting with a Wilmer Flores home run in the eighth inning to cut the deficit to one run; and where the Brewers’ bullpen was wobbly, the Mets’ ‘pen was solid, with Jerry Blevins getting a key strikeout of the cooling Eric Thames and Fernando Salas tossing two scoreless frames. Wheeler surrendered 10 hits across his innings, which required some Houdini-like escapes; the infield turned three double plays behind Wheeler, and the notable non-play of the day occurred in the fourth, when the Brewers loaded the bases with one out. Eric Sogard popped into foul territory, where Flores had it lined up when the batboy, who seemed on a collision course from step one, inexplicably collided with his arm. Rookie umpire Roberto Ortiz initially called Sogard out on interference before being overruled by crew chief Fieldin Culbreth, allowing the at-bat to continue, and spurring a Terry Collins ejection — because why not? Sogard would eventually ground into a double play. It has not been a banner week for Mets employees in uniform, and today they added the opposing team’s uniform to their ignominy. Milwaukee heads home in sole possession of first place in the NL Central, while the Mets fade ever faster. The Pirates roll into town tonight, with Gerrit Cole (2-5) facing Harvey the Rabbit (4-3). Mrs. Met is the odds-on favorite to go viral getting into a fistfight Friday night.